I think I jinxed myself yesterday talking about the cold because today we are under an extreme cold weather alert. The only upside to this cold weather is that there is usually some beautiful sunshine to go with it so today is really bright and clear outside! Since I posted about my chocolate torte experience on Sunday, I have been excited to go into more depth about how to make it. After trying The Coup’s chocolate torte, I was determined to create my own version free of tofu. I’m not really a fan of tofu in my desserts and I figured I could make one without it. Not only is this torte free of tofu, but it contains a certain green ingredient that is packed with healthy fats and vitamins. Crust adapted from The Coup Cookbook. Directions: Preheat oven to 375F. In a large bowl, sift together the dry crust ingredients (spelt, cocoa powder, baking powder, arrowroot powder, sugar and salt). 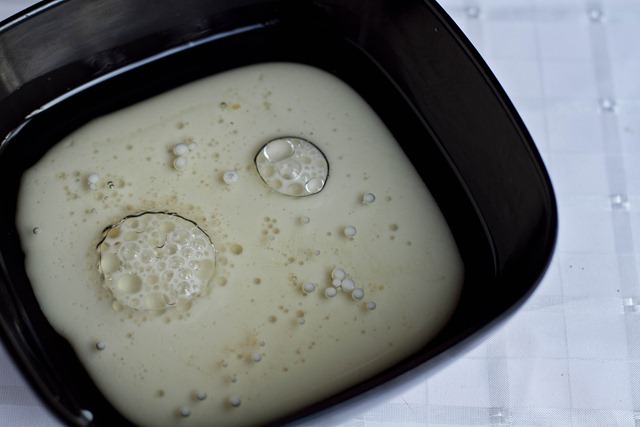 In a medium bowl, whisk the wet crust ingredients (oil, maple syrup, milk). Add wet to dry and stir well. 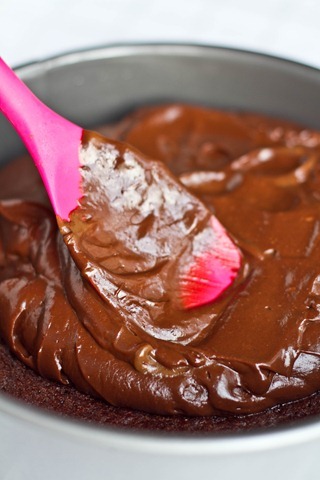 In a 10 inch springform cake pan, scoop on the crust batter and spread out with a wet spoon or wet hands. The batter will be very sticky so you will have to keep wetting your spoon/hands. Spread out as evenly as possible and bake for 25 minutes at 375F. Meanwhile, prepare the filling by placing all filling ingredients (except chocolate chips) into food processor. Process until smooth. Once the crust is done baking, remove from oven to slightly cool off for about 5-10 mins. 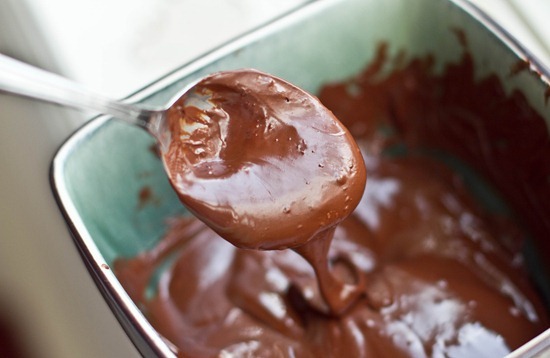 Now melt your chocolate chips in a small bowl and place melted chocolate into food processor mixture. Process until smooth. Scoop this filling into cake pan on top of crust. 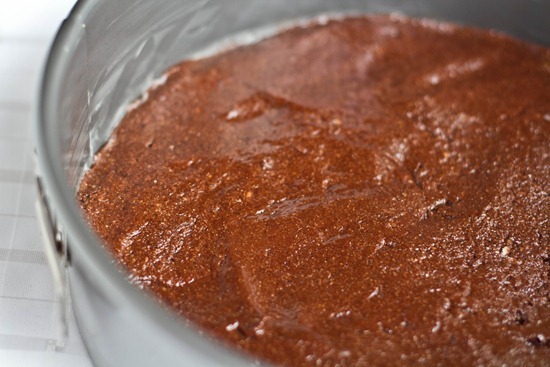 Smooth out as much as possible and then place in the freezer for 1.5-2 hours to firm up. Remove from freezer and allow to sit on the counter for about 10-15 minutes before serving chilled. Serves 10-12. Place leftover torte in the freezer wrapped and placed in a seal container. I’m not sure how long it lasts in the freezer, but I would guess 1-3 weeks if sealed properly. Note that this torte should be served chilled as it looses it’s firm shape when at room temperature. Eric and I also agreed that it tasted much better chilled. First things first, preheat the oven too 375F and gather up the dry crust ingredients. 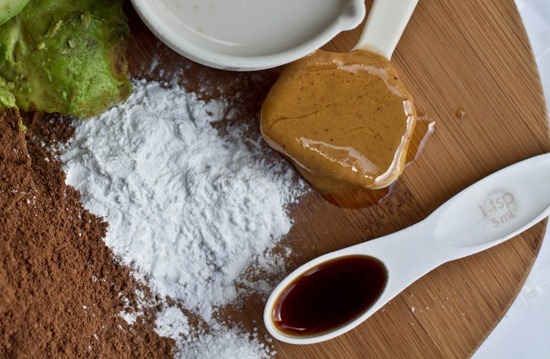 Gather the wet ingredients (almond milk, maple syrup, oil) in a small bowl and whisk. Add wet to dry and stir. Spread into a greased 10 inch springform cake pan. The crust batter will be very thick! Do not fear. Spread it around evenly as much as possible. Now bake the crust for 25 minutes at 375F. Meanwhile, let’s make the delicious chocolate filling! 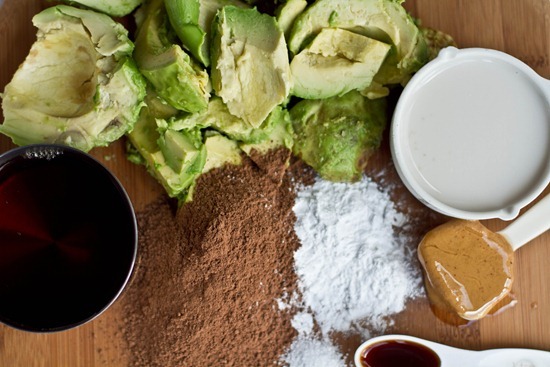 Gather up the 2 cups avocado flesh, almond milk, peanut butter, vanilla, arrowroot powder, cocoa powder, and kosher salt. Don’t grab the chocolate chips yet as we don’t need them right now. Process until smooth! This chocolate ‘pudding’ will taste incredible. Once your chocolate base is finished baking, remove it from the oven and let it cool for 10 minutes. Take a knife and carefully circle it around the base. Meanwhile, melt your chocolate chips. Mmmmm. 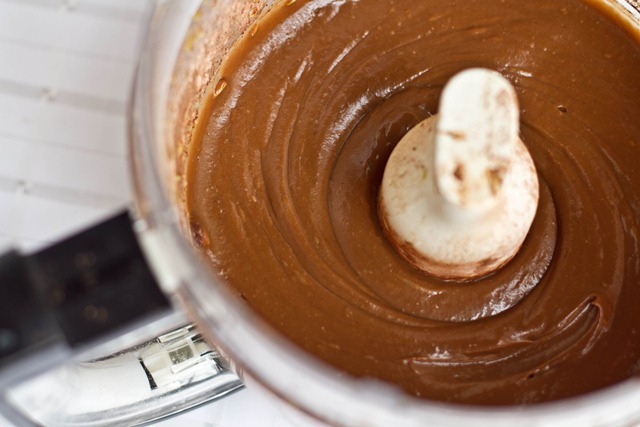 Now add this melted chocolate into the food processor and process until smooth. It will taste like HEAVEN!!! Your filling is now ready to be spread over the crust! 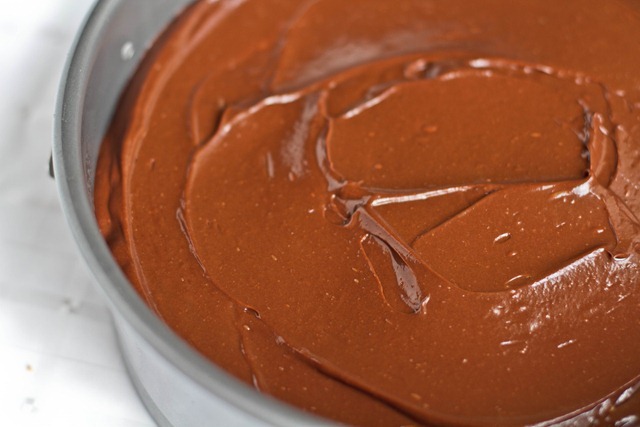 If you don’t feel like making the entire torte you could always just make this chocolate filling and eat it as pudding. :) It is that good. Now freeze the torte for 1.5-2 hours until firm. Once firm, take a knife and circle it around the edges once again, going very slowly. Allow it to sit for about 10 minutes and then open up the springform pan carefully and serve immediately! This torte is meant to be served cold, so don’t let it sit at room temperature to warm up (especially because there is avocado in the filling and you don’t want it to spoil). 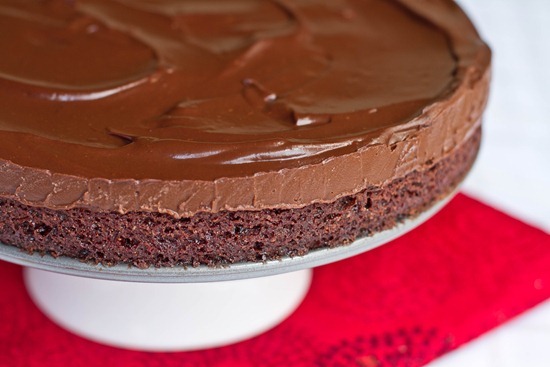 The result is an incredibly delicious, rich chocolate torte! Place any leftovers into a sealed container and pop it into the freezer until you get your next craving. I’m not sure how long this keeps in the freezer, but I would guess that if sealed properly it would keep a couple weeks. I am off to work on my holiday Glo bakery orders today. Have a great Thursday! this looks so amazing angela! but i’m not going to lie they avocado scares me a little….can you taste it at all? good luck tomorrow! you deserve to win!!!!!!!!!! When chilled you cannot taste the avocado at all. :) I could only slightly detect it when at room temp. 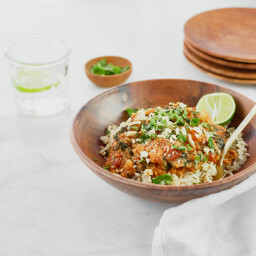 i am totally making this tonight…seriously, i die. ooooh my goodness. this looks delicious. not gonna lie, after i saw the photo you posted on twitter last night, i’ve been dreaming about this torte!! That looks amazing. Talk about a hefty dose of frosting. Yum! Oh yum – I’ve been meaning to try avocado chocolate cake, and now this avocado chocolate filling comes along…maybe I should try both together. Looks positively luscious! I’ve made chocolate pudding before with avocado and it tasted so good :) This looks delicious! It’s FREEZING here too and at this point I *want* all the snow this weekend because it makes the temperature go up. This dessert looks heavenly. I’ve made Averie’s choc mousse which uses mashed avocado and the texture is out of this world!!! that looks AWESOME! 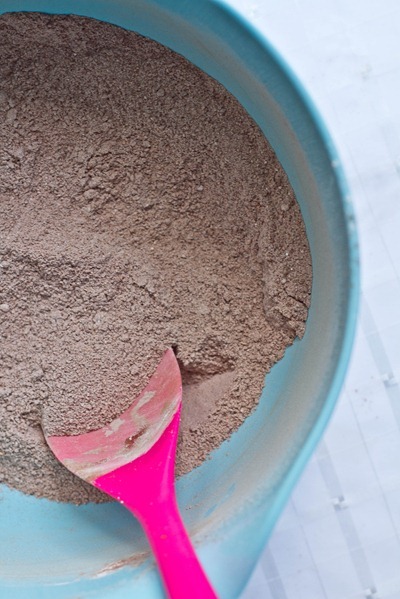 do you think cornstarch or flour would work instead of the arrowroot powder? Hi Angela – this looks wonderful. As soon as you said no tofu I wondered if you used avocados :) I also love that you said that recipes don’t always work on the first try – it makes me feel better about my flops. I actually had something work on the first time too – I made a vegan soy-free yogurt-y parfait – I was totally channeling all your wonderful parfait inspiration when I was working on it. The parfait part is coconut, pumpkin and white chia seeds. 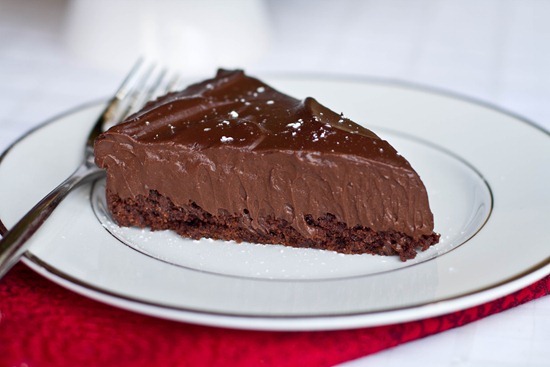 I could eat some chocolate torte this morning, this looks so yummy. I love that is has avocado too! I want torte for breakfast AHHHHHHH! ps. Just voted for ya! Good luck! you can find it at Bulk Barn or bulk food stores and often some natural food sections of some grocery stores have it too. It is used as a thickener, much like cornstarch, but it has a milder flavour and is better in things like puddings than cornstarch is. I find sometimes cornstarch has a grainy texture so I am not sure if it would work in this, but it might!! Cornflour is not the same as cornstarch as the flour is generally made from whole corn where as the starch is a processed complex carbohydrate (chemically speaking, starch molecules are just bonded sugar molecules) that is only part of whole corn. 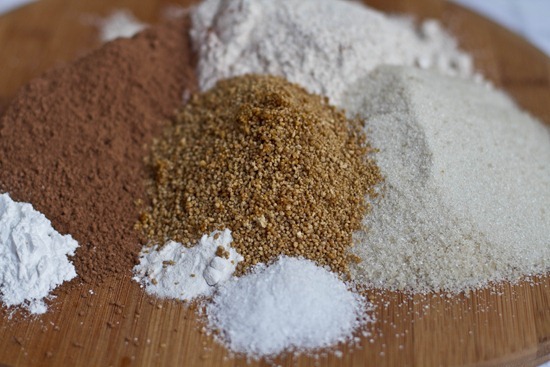 Sort of like while wheat flour is just one part of the whole wheat grain. Also, arrowroot powder only thickens when it is cooked. The same is so with cornstarch. So, you would probably be best just omitting the thickener unless you are going to cook the pudding! This looks like heaven on a platter!!!! I make raw vegan chocolate mousse, with AVOCADO! No one would EVER guess (nor do they) that it’s avo. They think it’s some super egg/dairy heavy mousse. I always bring it to parties, 4th of july it’s perfect or bday parties or holiday parties. It’s a huge crowd pleaser and b/c avos are full of fat, and I fatten it up even more with a boatload of cocoa powder and more agave than is legal :) it’s not lowcal/lowfat. 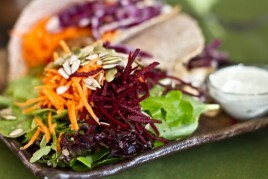 It’s a raw vegan dessert that will put some meat on your bones and omnis and vegans and KIDS all love it. I thin it out a bit w/ extra agave and frost kids’ bday cakes with it too. Sorry to ramble but you can see how much i love my avo/choc creations! But I love your creation even more! WOW, this looks incredibly delicious! I bet I could easily substitute spelt flour with brown rice flour to make this gluten free… And I like that it uses only the healthy fats of the avocado. I think avo goes will everything! I can’t taste it in the chocolate pudding version I make. Yesterday, I put 1.2 an avocado in a smoothie with pumpkin, vanilla, spices, and spinach. Not too shabby! Wow that looks soft and chocolaty. This looks so good! I discovered how wonderful raw chocolate avocado pudding is this summer so I’m sure I’d love this too! Wow. And it looks pretty simple to put together too. I’m daydreaming about how silky and luscious this must be! 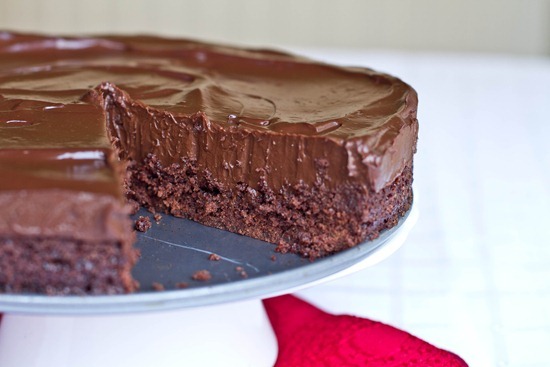 Mmm, I should make this for my sister-in-law who loves chocolate! I made your Pumpkin Pie Brownie for Thanksgiving and she LOVED it. This looks amazingly delicious and I love that it is soy-free. I love that there is avacado in this recipe! I love it! Oh. My. Gosh. Seriously, Eric is so lucky!! I’m thinking how good this would taste with a cup of coffee..pure joy I’m sure! I love how perfectly formed it it! Baking with avocado is the best, it makes everything so creamy and delicious! I love the Coup and I love your blog. Am delighted that the two of you met and hit it off. I’m totally going to make this…and not tell my family :) I love trickery desserts!! Wow– that looks professional!! Beautiful! 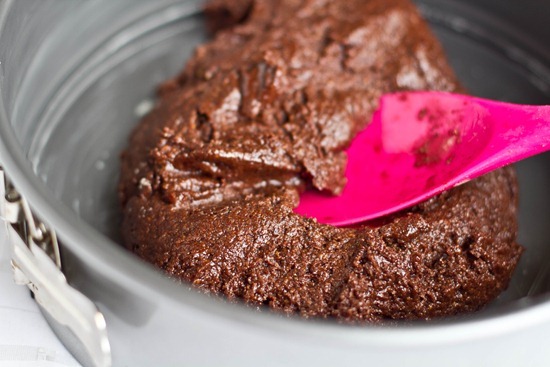 I tried chocolate avocado pudding once and loved it! This looks great! Oooooo let the chocolate coma commence! Oh man. That looks heavenly. I must make that!!! 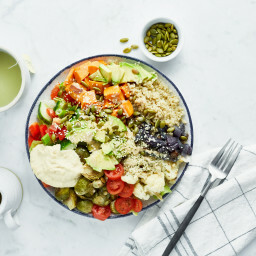 Wow, looks amazing and I love that it has avocados in it! Just yesterday I made a chocolate avocado pudding that turned out so good, my 8 year old loved it! He was eating and asking what ingredient I used to make it so creamy, then when I told him it was avocado he was happy and said “there was no way this could be bad then”! 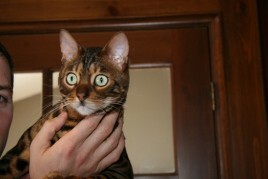 He is one after his mommy!! Love that! wow does this look amazing! any substitute for a gluten free crust? instead of the spelt flour? Im not sure but Bob’s red mill all purpose might do the trick? BTW–have you ever thought about being on DRAGON’s DEN?? they would LOVE you!! hehe I love that show. I’ve watched from the beginning and they always eat the food business ALIVE…no pun intended! Oh wow….this looks incredible!!! It would be gone in NO time flat in our house!! I voted for you and only you this round of Project Food Buzz, and I’m crossing my fingers you make it to the final three! I want this. NOW!!! I’ve been craving chocolate so much lately and this looks way healthier then the chocolate croissant that I want. I’ve been really curious about the whole masking avocado in chocolate thing lately… this looks like the perfect recipe to try. The Coup certainly knows their stuff! You kill me with these desserts – this looks amazing. OMG that looks delicious, angela. looove the idea of cooking with avocados! Oh my gosh. This has to be one of the best things you’ve ever made!! Ahhhh I wish I had the time to make this today! Oh my JESUS. My mouth literally dropped when I saw the picture of that…holy cow. Oh. Wow. I guess the random dream I had of you and other food bloggers teaching me a new recipe was a sign. This cake looks amazing. I can’t wait to make this!! It totally depends on the recipes. :) Occasionally I will post the calorie counts, but generally I do not have the time as it is very cumbersome to do so. I agree Angela. This looks so delicious. So decadent. Wonderful pictures~! I never thought avocado would be put into a dessert but this is amazing. i really want to make the topping and put that as a separate dessert like you said. Lookin’ good!!!!!!!!!!!! Sorry about the cold weather, though! 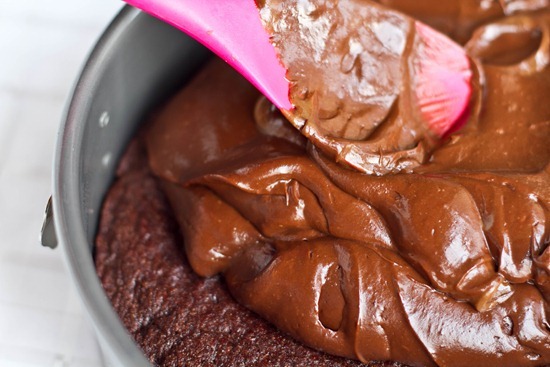 Holy chocolate…this looks absolutely delicious! OMG!!!!!!! You have done it again!!!!!!!! I am drooling. The pics look amazing! Well that looks like the most delicious thing ever. Oh My Noms this looks beyond luscious. Recipes like this speak to my need for hearty and rich comfort desserts so badly…how much do I want to just bake and eat all winter long; hibernation! I can’t help it….I must curse. DAMN! That looks amazing. I think that avocado is actually quite a mild flavour – I wouldn’t be able to taste it! This looks amazing. oh yum that looks so amazingly delicious!!! Hi! I wanted to leave this comment on your This Ain’t Grandma’s Sweet Potato Casserole page, but I couldn’t… I just wanted to say I used that recipe over Thanksgiving and it was a wondrous hit with everyone :) Also, I came across vegan marshmallows!!! Here is the link, I found them on Amazon.com strangely enough! My gosh this looks so so amaaaaaazing Angela, so thick and delicious! I have only ever tried fudge brownies with avocado, it’s such a great substitute ingredient! So inspiring, your ideas, your recipes, your blog. I’m a huge fan, following your blog for a while. The Itty Bitty Carrot Cake Cookies I tried a week ago are beloved here at home. 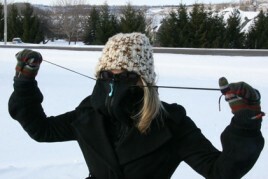 I am sooo making this when I get home for Christmas break! I will feel sorry for my older brother, though – he’s allergic to avocados! Angela, I was wondering if you’re still using the same skin products that you were when you did Project Glow or if it has changed? Your skin still looks great and was wondering if you’ve changed anything? I’ve always wanted to try baking with avocado! This looks sinful! I’ve always wanted to try baking with avocado! This looks sinful! yum! Everything you make looks amazing. I can’t wait to try the club med salad and this torte. YAYYYYYYYYY!!! You did it….congrats on making another round for Project Food Blog & for being Reader’s Choice. I think you are going to make it all the way to the end!! Yay!! Congrats on advancing to the final round! Yay! You advanced to the last round!!! I am so happy! Go Canada! Go Vegans! Go Angela! Yay! Congrats! I’m so nervous for you, but I know you can do this! You’re awesome!! I have been checking all morning and it is finally posted!!! Congratulations you made it to the last round and got readers choice!!!! You so own this!!! No matter what you make, it always looks incredible!!!! I wanted to stop by and congratulate you on making it to the finals. Man, pressure! I wish we could help you win just by voting, but it looks like that’s up to the judges. After having made 4 of your recipes already, though, I have complete faith you can do this on your own, no problem. Good luck! Congrats on advancing into the next round!! I’m a Canadian too, so I’m double-proud. Keep up the amazing work! Congratulations on winning Reader’s Choice, and on advancing to the final round! I’m so happy for you – you totally deserve it! It’s funny, your blog was the first one I started to follow, since then I’ve started following some others too, but yours is the ABSOLUTE best! Your descriptions, your photos, recipes (I love how you have the print option now), stories, everything. Way to go!!!! ps. I wish you luck in the next round, but I don’t think you’ll need any luck! Congrats on making it to the final round btw – thats SO exciting! And much deserved. I am so excited for you! You have truly ‘owned’ this contest. oh YUM!!!! this cake looks simply amazing!! 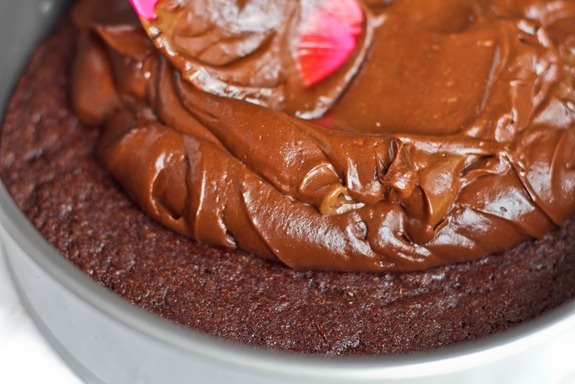 I love avocado to make chocolate creamy! It’s so healthy too! Made it tonight and I am still in chocolate bliss. Good luck with the final PFB challenge I really hope you win! Hi Angela! :) Just wanted to tell you that I think your blog is amazing–so amazing that it inspired me to start blogging! I’ve recently been struggling with numbers, and when I came across your blog I read that you had struggled with overcoming calorie counting as well. It’s refreshing to know you overcame that struggle and that there’s hope for me! :) I am definitely going to have to try some of your recipes b/c they look simply irresistible! Congrats on making it to the final round, the best of luck on the final post! 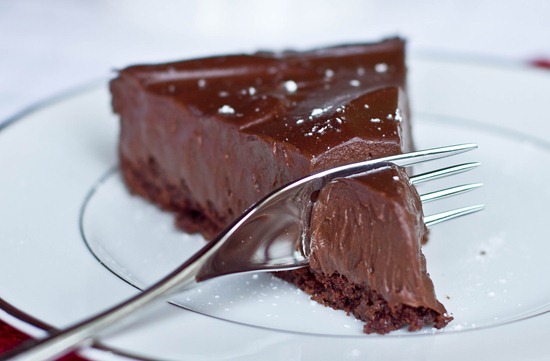 the chocolate torte looks amazing, I´m totally making this next week. oh, and good luck on the final challenge. Congrats on being one of the final three in Project Food Blog! I just saw it and really hope you’ll win. So excited for your final post! Good luck! Congratulations! I’m excited to see you made the final 3! and Reader’s Choice to boot!! I have never done any vegan baking, but really want to give it a go sometime, I’m definitely adding this recipe to the list of contenders for my first ever vegan baking challenge! It looks absolutely amazing! I made another one of your chocolate puddings and it was absolutely delicious! I can’t wait to make this torte! Made this today…oh.my.god. So good! Especially the filling, unbelieveable. So glad you like it!!! we are obsessed with it! I am just recently looking into changing the food in my life! I am attending a dessert potluck tomorrow night and this has been on my brain! How long do you think it takes to get to room temp? I would keep it in the freezer until serving, but it might sit out on the table for half an hour or more? Any idea? you should serve it chilled for sure (it was much better chilled than at room temp)…we remove it from the freezer and let it sit on the counter for 10-15 mins I think? I did your Chocolate Torte yesterdays and that’s the perfect chocolate desert. When I was eating, I almost cry. I have no word to describe how good this was. All my family loved it. Thank you very much for sharing all you recipe. PS- I moved this comment to the original post. Thank you for the quick reply. I feel awful that I made you feel bad by my comments. I shouldn’t have said anything. I think I was just frustrated b/c I have felt nauseas since then just thinking about the dessert. I do apologize for being harsh and in all honesty am SO thankful for your site and that you offer vegan recipes for people. I wish everyone did that. I will give some other recipes a try and I’m sure they will be delicious. But I do agree, not everyone will like every recipe. Thank you for providing cruelty free options for people. I hope you have a great day! Yes I think it would work without it. If I remember it was just 1 tbsp right? Or you could use another type of nut butter. Be sure to serve the torte cold! Is it necessary to use the peanut butter? can you detect a peanut taste in the final product? Also I’m a huge OSG fan! I couldn’t detect a peanuty taste. If I can remember there was only a table spoon or 2, so it can probably be left out. I looooooove this recipe! I have to admit, I have even used the filling as frosting– it pipes beautifully through a pastry bag, and it holds up nicely when I frost cupcakes with it!!! Thank you! Wow I had no idea…I will have to try this! Did you have to chill it first? Love love love this recipe. I made it yesterday to take to my mom’s for Thanksgiving. Everyone who ate it absolutely loved it. My sister, a baker, kept saying, “I taste something. I can’t quite make it out.” Eventually, she figured out that it was avocado (because I was keeping mum lest I scare away people…), but she said she loved the “zippy” flavor of the avocado combined with the rich chocolate. No one else could tell (or they kept saying they tasted banana). I left with just a quarter of the tort, which is awesome, considering there were about a million desserts to pick from! Thats so great to hear, thanks for letting me know! I’ve been wanting to make this recipe FOREVER. Im pretty sure it must taste amazing with cocoa! Only I thought ‘hm, maybe I can make it with carob powder insteat’ (my dad’s allergic to cocoa). WORST idea ever. 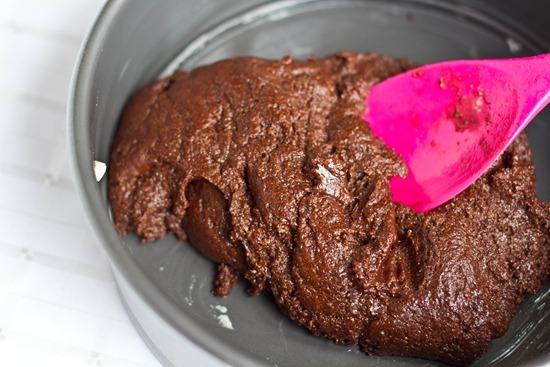 Please, anyone who’s thinking carob in this recipe- don’t even go there. Tastes disgusting. I made this torte and I was disappointed in this recipe. The avocado flavor was present in my final torte, leaving it with a strange smell and flavor. It looked beautiful, but didn’t meet expectations. 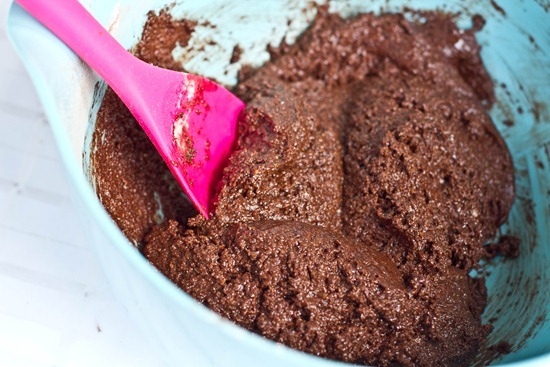 I tried this using 1 cup of almond meal and 6 all purpose flour, it worked out lovely! Oops I meant 6 tbsp all purpose flour! Just made it for a delectable dessert,….oooooh much more filling then I expected (especially since I couldn’t resist that chocolate pudding when pouring it) I made it in a 7.5 inch pan because my mum prefers a tall thick slice of cake, turned out beautiful, fancy enough for a restaurant! I’ve tried it,but made it with gluten-free crust!!! and it was the very very best chocolate torte I’ve ever had. I made it for my mum’s anniversary and she loved it so much that it was gone on the other day! Thank you very much for this another delicious recipe. OMG…I made this and it was soooo delish. My friend didn’t believe I made it. Great recipe. Everything i’ve made from your site is so good. Thank you for sharing all your wonderful recipes. Hey Leanna, I would probably suggest sunflower seed butter (Sunbutter is a great brand). Pumpkin and tahini are quite bitter, so I’m not sure about those. Good luck! Yum, but avocados are so expensive(2$ or 3$ for one), and I can’t find vegan choc chips. the ones that are available is exorbitant. I’m not too familiar with spelt flour. Would whole wheat pastry flour work? Or all purpose? By the way, all your recipes are making it really hard for me to decide what to make for my family Christmas party! Oh and also, is the 2c of avocado flesh mashed or cubed? Just made this for the second time tonight–so good! Unfortunately, I realized too late I only had 1 avocado (instead of 4). I used the 1 small avocado I had, but subbed in soaked cashews, dates, 1 lb of spinach, and an extra 1/3 cup chocolate chips. It was AMAZING! Couldn’t taste any of the “mystery” ingredients nor the telltale aftertaste of avocado oil. I made this for today…and its weird….but it really roze up…compared to your pictures. we havn’t had it yet and i just realised i forgot to run the knife around it..it will probably be a massive disaster but what would i have done wrong to make it rise up? it went to the top of the 10inch pan!. While staying in the “cabin” and avoiding the snowstorm outside I made this chocolate torte. It is brilliant. I love all the textures and flavors… and the cake is nice and moist. I think I might be glowing now from eating this creation. I made it today, but the avocado tasted so funny I couldn’t bare it :( maybe you should put a lot less !! Non-vegans could use cow’s milk (rather than almond, etc.) in the pudding/filling without problem, right? I just made this torte, absolutely amazing! None of my guests could guess the main ingredient for the filling is avocado. Everyone loved it. 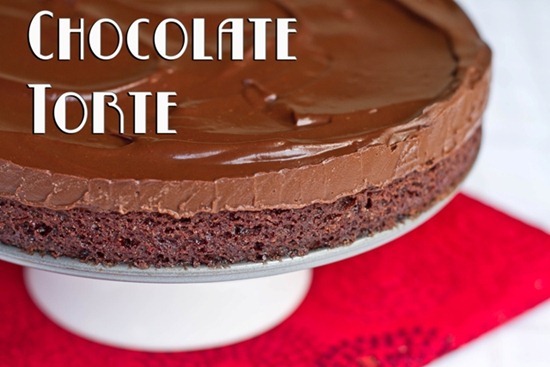 I have one question about this recipe (Chilled Double Chocolate Torte) – where does the name “torte” come from? I am interested, because in our country the word for “cake” in “torta”, so it is simmilar to your name” torte” – the only difference is in the last letter. I am going to be making this tomorrow and I was wondering if you think it’s ok to use normal flour instead of the spelt flour? I love your website and I already tried lots of your recipes. Till now my favourite is the creamy tomato pasta! Sooo delicious!